Despite their famous limited size and their crowds during summer, those of Liguria are some of the most beatiful beaches and bays in Italy. With a 300 km long coastline, Liguria offers a wide choice for enjoying its beautiful sea: sandy beaches and rocks, shallows and cliffs overlooking the water, crowded beaches and tiny coves to be enjoyed alone, in peace and relax. Beaches in Liguria are characterized by an alternance of sand and pebbles, and separeted by reefs with small coves overlooking the sea. Some of them have wonderful crystal-clear sea water and got the glamorous Bandiera Blu (the Blue Flag), an acknowledgement generally given to sea resorts that keep the sea and the surrounding nature clean and safe. Liguria is the most awarded Italian region and, as a matter of fact, it can boast of 18 sea resorts with Bandiera Blu. Among these, we find the wonderful Lerici, a lovely village from which you can easily reach the Cinque Terre by boat. The area of the Cinque Terre and its sea, represent a unique breathtaking natural spectacle. Wonderful beaches, beautiful cliffs and crystal sea waters, make of the Cinque Terre one of the most welcoming areas of the east Ligurian riviera. With its charming small beaches hidden among rocks, and its stunning coves immersed in cobalt blue waters, this is definitely one of the most suggestive places of the region. The Five lands in fact - site belonging to the UNESCO World Natural Heritage for its undisputed beauty - is constituted by high and rocky coasts overlooking a crystal sea, rich in fishes and marine flora. The surrounding nature is wild and unspoiled. It represents the ideal destination for those searching for an unspoiled corner of nature, and are willing to walk in order to fully enjoy it. 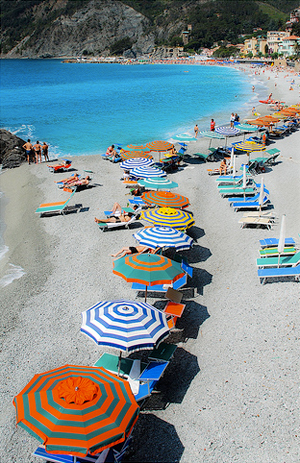 The only village of the Cinque Terre with a wider beach if compared to the others, is Monterosso, situated at the west end of the region. Last but not least, visitors who wish to fully enjoy the Liguria's wonderful nature and peaceful atmosphere, should not miss the beautiful bays of the region: the San Fruttuoso beach in Camogli, the Spiaggia di Paraggi, the Baia del Silenzio in Sestri Levante, the Baia dei Saraceni in Varigotti and La Spiaggia in Zoagli, all of them located very close to Genova and all representing unique,picturesque places for those whose desire for holidays is to have relax and enjoy a unique breathtaking nature. In addition to the stunning natural inlets above mentioned, much of the Ligurian beaches is equipped, especially the ones located close to big centres such as Sanremo, Portofino, Porto Venere, Lerici, Sarzana, Recco and Camogli. There you will find lidos equipped with umbrellas and deckchairs for relaxing during the hottest hours in summer, bars and accomodation facilities that offer any kind of comfort.